Riding boots are a must have closet staple. You don't have to be an equestrienne to wear them and you only need a few key pieces in your closet to style them. Tuck your skinny jeans into your boots for a sleek look. Pair them with a tunic and leggings for a casual and comfy outfit. Wear them with a pencil skirt for workwear to the office or a skater skirt or dress for a more fun and flirty look. Just be sure to stay away from baggy jeans that will bunch up in your boots. Your jeans should be fitted at the knee. These Sam Edelman Penny boots were a birthday gift last year and they were on repeat all winter. The rich brown color is a great alternative to black and the distressed burnished leather gives them an edgy feel. 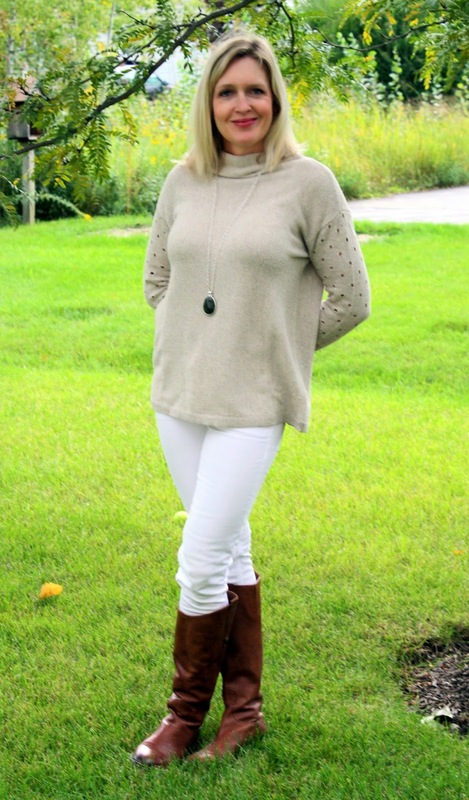 Today I'm styling my riding boots with my white skinny jeans for a fall transition outfit. I think you can wear white after Labor day as long as you stay away from a summery fabrics and colors. What's your favorite way to wear your riding boots? Linking up with these fabulous bloggers here and Happiness at Mid-Life. YES. This suits you SO WELL. You know I have all kinds of boots but have never found that perfect pair of riding boots (I have REALLY short calves), this is on my list of things to do. Maybe the Sam Edelman one's would be a good option...how tall are you btw!!? Would love to have you link this up if you can, you are one stylish mama! Love everything about this look Jill!! Those boots are such a classic and love how you styled them with the white jeans and your gorgeous sweater. How gorgeous are these boots? The color is perfect, and I definitely see why you had hem on repeat. Can't wait to see more of them this year! I love that it is riding boot time of year! I LOVE the color of yours! So warm and bright! I love your boots! I still haven't tried riding boots with white jeans but it's something I've been meaning to do. I agree, these are a must. I love them paired with your white! Such a great way to wear white jeans in the cooler temps. I love your outfit! The riding boots paired with white jeans look great! Perfect way to transition in to fall. Great look! I think I love wearing my boots with skinny jeans best, but tights are great, too! Love your riding boots, I agree they are such a closet staple. I wear mine every chance I get! I love your neutral color palette here and I think the boots you chose look much better than if you'd gone with black for this outfit. It all works together so nicely and that shade of beigey taupe of your sweater is really flattering. I don't own many things in that color but I think I need to try it more often! I love your whole look, those are great boots to wear with anything but I especially love them with your white jeans. You look fab! Great boots!!! And I love that color with white jeans. This is a classic, perfect fall look! I usually don't wear white after labor day, but I would wear this look! And, I want that sweater!! I just got some new riding boots from The Gap Outlet, but I have some nicer wedge heeled boots, too in brown. I pretty much live in riding boots during the fall/winter. I've decided that I definitely need a new brown pair - I love yours! They look great paired with the white jeans - really pretty! Paring your riding boots with white is such a great idea. It really helps transition both the white and the boots - it's like you're meeting perfectly in the middle! Every year I think about getting some riding boots, but never do! But I love them, you look great and I'm inspired! GREAT BOOTS! I love, love, love my boots. mind blown! never thought to try them with white pants but love love love the look!!! I always love brown riding boots with neutrals like you did here -love the chicness of it. BTW, I host a weekly link up on Thursdays and hope that you will join me. Every girl should own a nice pair of riding boots, it should be a mandatory law! I got a pair from Coach a few years ago and they have only gotten better with age! Yours are beautiful! Great outfit! Definitely a classic and very versatile. I love how you styled them. I love those boots! I wore my cognac boots to the ground last year so this year it's time for something new! Love this whole look and the details on the sleeve of your sweater! Looking good! I'm getting pumped for boots season! Love the way you wore these gorgeous Sam Edelman's with white denim. Awesome look, doll! I love riding boots! Those boots are seriously adorable! This is such a cute fall outfit. Love those riding boots and the details on the sweater are adorable. LOVE this look!! The white, tan and brown look so perfect together and those boots are fabulous! You look so chic. Love this outfit on you! So cute!!! I need a new pair!!! I am waiting to break out my riding boots until it gets just a little colder here. I don't think I can do it in 70 degree weather! Counting down the days! Such a cute outfit! ooooh they are pretty, love this color with white jeans. You look beautiful Jill. What a pretty outfit!! I love your boots. I love wearing my boots with a sweater dress and a coat!! I love a great pair of riding boots! I need to get myself a pair of black ones! What a stylish fall look! Those riding boots are the most perfect color! And they look great with your white jeans! Love the look of the riding boots on white denims. Love this neutral look on you. THose boots are fab, and I like the longer tan sweater! Riding boots are a fall staple! This pair looks great on you! I adore your sweater! A good pair of riding boots can last a lifetime, your Sam Edelman boots are super chic. Love the cognac brown.